Looking for Apple iPad repair service in Seattle? iPlayPower is the iPad repair service for you! 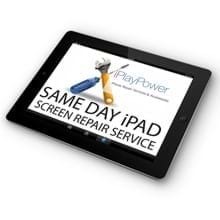 When you bring your iPad to iPlayPower, you can expect top quality iPad screen repair with fast, same day service. Our experience working on multiple iPad models with various problems and issues enables us to provide you with an honest assessment and prompt repair service. Get your iPad fixed the right way TODAY at a very reasonable price. Get your iPad repaired the right way. TODAY! If you are in need of a cracked iPad screen repair and you want the highest quality brand new replacement parts for your iPad, iPlayPower is the right choice for you. See your iPad work like the day you bought it. All repairs are done with O.E.M. iPad replacement parts. Each replacement touchscreen is tested before installation. iPlayPower can save you money and give your iPad a new look.